Fall is the best time for planting grass seed and a new lawn in the cool sections of the United States. Here are some cool-climate grasses. Cool-Climate Grasses are the types most suitable for use in the northern sections of the country, including the northeastern, northern, midwestern, and northern Pacific coastal areas. In these climates winter temperatures go down to zero or below; and the summers, while hot, do not normally have exceptionally long periods with no rainfall. The perennial grasses which grow in them begin vigorous growth early in spring and continue it until early or midsummer. They mature, if left to grow normally, in June to early July and then take a midsummer rest during July and August. Vigorous growth is renewed in late August or September, but it is of a character different from the spring growth, the individual plants tending to “tiller” or spread horizontally instead of sending up tall, flowering, seed-bearing stalks. Some of these grasses tend to spread or creep, others form tufts or clumps. They are quite generally used in mixtures, as the resulting turf, under most conditions, requires less constant and expert care than do single grass turfs of Bent or Bluegrass. Bentgrasses make the most beautiful turf of all, forming a dense, fine mat of rich, green color. They are used for golf courses and for smooth, close-clipped lawns on large estates where they can receive the constant care they need: moderate fertilization, frequent top-dressing, deep watering, close mowing (from 1/2 to 1-1/4 inches), and disease control. Because all the Bents are not susceptible to the same diseases, the planting of mixtures of several is sometimes resorted to, in order to assure good coverage. Ten per cent of Colonial Bent (a dependable, noncreeping form) is often used in good cool-climate grass mixtures where a fine lawn texture is preferred. 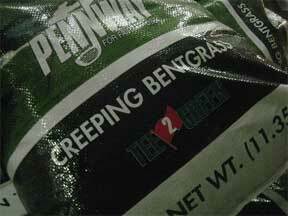 Bentgrasses do best with a soil pH of 5.5 to 6.5 (slightly acid) and well-drained loam. Most of them endure little shade. .
Colonial Bent (A. tenuis) is available in many improved strains which have been developed in different sections of the country to suit special conditions. Creeping Bents (A. palustris varieties), commonly used for putting greens, are lighter in color than Colonial and require cool, moist conditions and high fertility, but they have some shade tolerance. They grow by creeping stems and are quite resistant to salt spray, so that they are some-times used as lawn grasses near the seashore where they prosper naturally. Because they are susceptible to certain diseases (snow mold, dollar spot, and brown patch) they are not generally recommended for lawns, as disease control measures must be taken regularly. They also require very close cutting-1/2 to 3/4 inch. Redtop (A. alba) is a much less demanding grass than the other Bents, accommodating itself to hot or cool conditions and with a fair shade tolerance. The color is light to bluish green and, when mature, the texture is coarse, quite unlike other Bents. It is short-lived however and, as it germinates quickly and is fine textured in the seedling stage, 10 per cent of Redtop is often used as a “nurse” grass in a mixture to make a temporary green cover until the more permanent grasses (such as Colonial Bent or Kentucky Bluegrass) become well established. By that time the short-lived Redtop has disappeared. Since, like other Bents, it is susceptible to snow mold and brown patch, large percentages of Redtop should not be used in mixtures. Velvet Bent (A. canina) endures heat and cold well; is somewhat shade and drought tolerant but requires plenty of fertilizer. It produces a dark green, fine-textured turf of fairly long life. Like Creeping Bent, Velvet roots at the nodes or joints and is useful chiefly on putting greens. As it is disease resistant, except for copper spot, it has distinct advantages in areas where it grows well. Bluegrasses are highly prized for cool-climate lawns. Kentucky Blue and its varieties form the backbone of the average, good, permanent lawn mixtures in cool-climate areas, while other Poas are useful for special conditions. Kentucky Bluegrass (Poa pratensis) is a rather fine-bladed grass, deep blue-green in color, which spreads by underground rootstocks and forms a somewhat open turf of medium texture. Though slow to germinate, once estab-lished it is long-lived, making a really permanent lawn. It requires full sun, a neutral or slightly acid soil (pH 6.0 to 7.0); plenty of fertilizer and water. In areas where it grows well, Kentucky Blue or one of its improved strains can be planted alone if desired. Mixtures containing from 80 to 30 per cent, depending on location and special conditions, produce a green turf more quickly than a 100 per cent Bluegrass lawn. Merion Blue, a variety discovered on the Merion Golf Course near Philadelphia, is generally recommended as the best Kentucky Blue available. It is more vigorous, deeper rooted, and more disease and drought resistant than common Kentucky Blue. Its shade tolerance is higher, and the color is deeper and is maintained over a longer period. It can also be mowed more closely (1/2 to 1-1/2 inches) than the Kentucky Blue. It should be fall planted, from mid-August to mid-September, as germination is slow. In using straight Merion Blue seed; 2 to 3 pounds should be sown to each 1000 square feet for the average home lawn. Under ideal conditions, 1 pound per 1000 square feet is sufficient. If possible, use a seed spreader. A well-established Merion lawn needs little artificial watering. Buy certified seed. Canada Bluegrass (Poa cornpressa) is a deep-rooted, coarse, scraggly hay grass which tolerates poor soil and shade if it has plenty of moisture. Though unsuitable for lawns because of its coarse texture and because it is short-lived if kept mowed, it is useful on polo and athletic fields where conditions are suitable and where it can be cut very high (3 to 4 inches) and very infrequently. Rough Bluegrass or Meadowgrass (Poa trivialis) prefers a fertile soil and damp shade, where it produces a light green, low-growing carpet. It is highly recommended in many sections as a shade grass. From 80 to 30 per cent is often included in shade mixtures. Sow at the rate of 3 pounds per 1000 square feet. Fescues make sturdy turf which can take rough treatment. They thrive in sun or shade, endure moist or dry conditions, and can get along on soils of comparatively low fertility; though they appreciate a good loam. These grasses are slow growing, of a stiff, wiry but fine texture, and deep green in color. They prefer a pH of 5.5 to 6.5 but can survive considerable acidity. Mowing should be 2 to 3 inches in height. Red Fescue (F. rubra fallax) or one of its improved strains produce tight, wiry turf and are used at rates of 50 to 30 per cent in most cool-climate grass mixtures. Meadow Fescue (F. elatior), a bright green, perennial species, may be added as a temporary nurse grass to shade mixtures where the soil is deep and rich. It is a heat- and drought-resistant species. Sheep Fescue (F. ovina) is a northern bunch grass which forms dense bluish-gray tufts and is sometimes used for turf on sandy soils in the Northeast and Pacific Northwest where soil is sandy and used for erosion control and where other lawn grasses do not succeed. Tall Fescue (F. elatior arundinacea) and its strains (Kentucky 31 being one), produce better turf for play areas, athletic fields, airports, etc., especially in areas where they have to contend with heat, high humidity, and disease. They are not generally recommended for lawns but grow well on humus-rich, sandy, or clayey soils – wet or dry – if well fertilized. Mowing height is 3 inches. Ryegrasses are of two sorts – annual and perennial. Their texture is medium coarse, with broad, shiny leaves, the color dark green. They are happy in cool or hot weather, prefer a well-drained, heavy but fertile soil, and endure drought well. All are seeded at the rate of 5 pounds per 1000 square feet. Germination is rapid. Domestic or Italian Rye (L. multiflorum), the annual species, is used at the rate of 20 to 10 per cent, chiefly as nurse or temporary grass to give a quick effect in seed mixtures until the more permanent species take over, at which time the short-lived Ryegrasses are crowded out. They are also useful for temporary lawns and for winter “overplanting” of southern summer grasses like Bermuda and Centipede. When used alone, sow at the rate of 4 to 5 pounds per 1000 square feet. Perennial Ryegrass (L. perenne) is a quite long-lived species and makes a really permanent, coarse turf in areas where it grows well. It endures shade much better than annual Ryegrass and is drought tolerant. Often it is spring planted as a temporary new lawn, to be turned under as green manure in August or even a year or more later, when the home owner is ready to seed his permanent turf. Or planted in early autumn, it gives a green lawn through the winter and the following summer and can be turned under in August, to be replaced by a mixture of the better permanent grasses. Seed at the rate of 4 to 5 pounds per 1000 square feet. Before planting or rehabbing your lawn do some research to find out what grasses do best in your area. Also take into consideration the maintenance required.